Angioplasty opens up blockages in the arteries around the heart and improves blood flow. Although still considered a surgical procedure, since there is an opening made in the skin, angioplasty is easier on the person than coronary bypass surgery. In this procedure, a special balloon is pushed through a tube inserted into the artery in the groin or wrist and is then inflated to open up portions of the arteries that have become narrow. The opening is very small, less than 1 cm long and about 1 mm wide, so stitches are not usually needed. Your doctor will decide when and how frequently this procedure is required. Angioplasty is used to improve blood flow to the heart in cases where the arteries around the heart have narrowed due to atherosclerosis (hardening of the inside walls of your arteries). It is commonly performed on people who have angina (chest pain) that isn't relieved by use of medication. Other times, during an acute heart attack, it is used to quickly open up a completely blocked or very narrow artery. Angioplasty is easier on the person than bypass surgery and, under certain circumstances, has similar long-term results. Often, people who are treated with angioplasty have to undergo the procedure again due to re-narrowing of the area that was opened up. While angioplasty is easier on the person than bypass surgery and major complications are not common, this procedure does carry some risks. These include bleeding, infection, damage to the artery (that may require emergency bypass surgery), heart attack, stroke, and death. There is also the risk that the affected artery can become narrow again over time, requiring another angioplasty or even bypass surgery. You may experience pain or soreness at the insertion site. Angioplasty is usually performed by a cardiologist and a team of specialized health care professionals, including nurses and technicians. Angioplasty is performed using local anesthetic, so you will be awake during the procedure but unable to feel it. You may also be given a mild sedative to relax you, as well as blood-thinning medications to reduce the risk of clotting. Angioplasty is usually done through an artery in the groin or sometimes the arm. 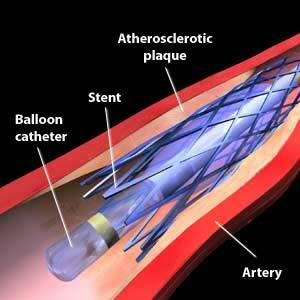 Your doctor will insert a thin tube, called a catheter, into the artery. The catheter includes a small balloon and a small wire tube, called a stent. Once the catheter is in place, a dye is injected and X-rays are taken, which tell the doctor exactly where the blockages are and how narrow the artery is. This is also known as an angiogram and functions as a map for the doctor. The doctor will then inflate the balloon, opening the stent and pushing it against the artery wall. After the procedure is complete, the cells that line the blood vessel will grow around the stent, holding it in place. In angioplasties where no stent is used, your doctor will use the balloon itself to open the blockage, inflating it against the artery wall and then deflating it, often several times, to stretch the artery wall. This procedure usually takes between 30 minutes and 2 hours. Your doctor will provide specific instructions for preparing for an angioplasty. Usually, you will require blood tests, an X-ray, and an electrocardiogram (ECG or EKG) before the procedure. Do not eat for 8 hours before the procedure. You may continue to drink clear liquids until 2 hours before the procedure. If your doctor has recommended different times, follow the timing recommended by your doctor. After the procedure, you may feel drowsy from the sedatives and feel pain or soreness at the insertion site. Once the catheter is removed, it is important to keep your leg still for up to 6 hours to prevent further bleeding. You will also likely have a bandage or something else to apply pressure to the site to prevent bleeding. Typically, an angioplasty requires an overnight stay in the hospital. Your heart rate and vital signs will be monitored throughout this time. You will need to arrange for someone to drive you home from the hospital. Once home, over the next several days you should avoid any type of lifting or other strenuous physical activity. Your doctor will advise you when you will be able to return to work and resume driving and other physical activity. If a stent was used, you will need to take blood thinners to reduce the risk of blood clots in the stent. Angioplasty is considered effective at improving blood flow to the heart, especially when a stent is used. There is still a risk of future blockages, which could require another angioplasty or even bypass surgery. A blockage in the artery is widened by inflating the balloon catheter to fully expand the stent.